We’ve been working through layout options in the great room, fine tuning the original design, and creating something new and exciting for FPB 97-1. There is an interesting contrast between two concepts. 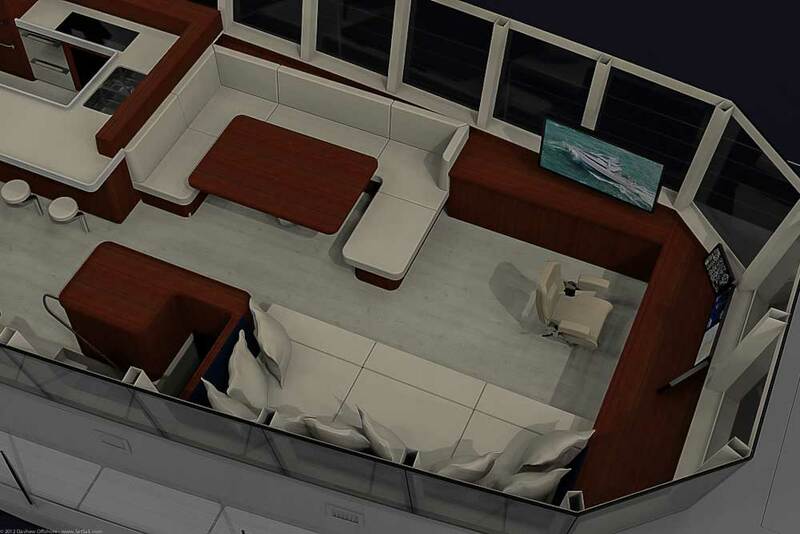 The forward end of the FPB 97-1 great room has a different layout from the original concept. Angles and curves have been squared up, and the settee has become a large couch and/or day bed. Notice the narrow cushion sections at the inboard edge. These are supported by a hinged front panel, and provide a much enhanced lounging area for kicking back, watching a movie, or taking a nap. This is a rendering with the hinged panel stowed. What we have now is a large, comfortable sofa. With conning being done on the Matrix deck above, the instrumentation here can be minimized, if you so desire. Or, with a few small mods one can duplicate the layout of the Matrix deck. We are in the initial throws of wrestling with this on FPB 97-1, and are looking at a variety of design options that will preserve the functionality of the navigation and vessel management systems, without creating a Star Ship Enterprise type bridge in this living area. The bottom line design-wise is that the owner needs to be able to operate his/her FPB from both positions when on passage. One of the disadvantages of all this computer power we have is the ability to play infinite what-if games. You can vary surface, color, texture, lighting patterns–all of which we have been doing in conjunction with optimizing the look for the owner of 97-1. We are not there yet, but we are getting close. 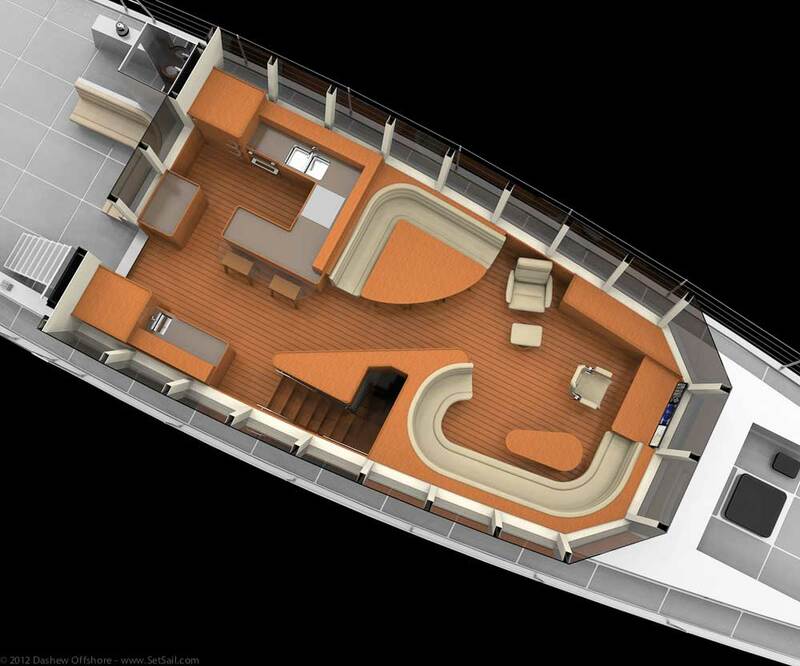 For comparison, the above rendering shows the original FPB 97 great room layout. Combining working and living areas in one great room has proven itself over and over during the past 25 years. 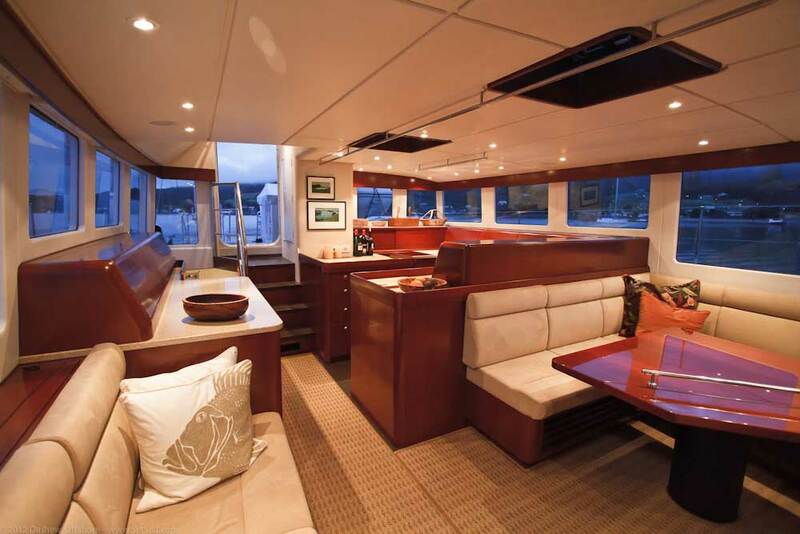 This layout is particularly efficient when cruising as a family, without a large crew on passage. 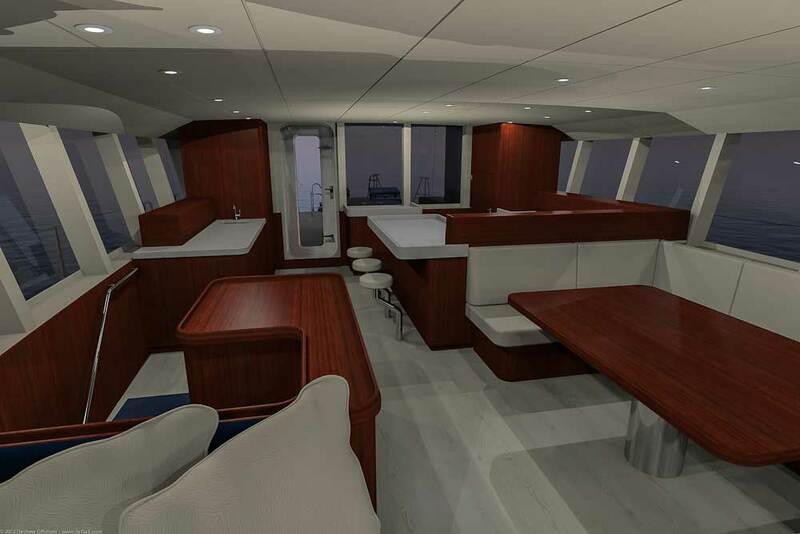 Overall, FPB 97-1 maintains the original open great room design of the FPB concept. The curved settee of the original design has elicited several comments questioning its wisdom. On a small yacht those curves in the seating arrangement would become a bother after a while, as they limit the areas in which you can relax, feet up, and have good back support. But with the FPB 97, the ergonomics will work fine. You add in a foot stool or two, and then there are lots of comfortable options options for lounging with your feet up and back supported. Throw a pillow onto the small table, and it becomes a comfy home for feet while watching a movie on the TV that rises out of the cabinet across the way. With the day bed/sofa configuration on 97-1 there is a totally different approach to watching TV, lounging, or taking a nap underway while still being handy to the person on watch. 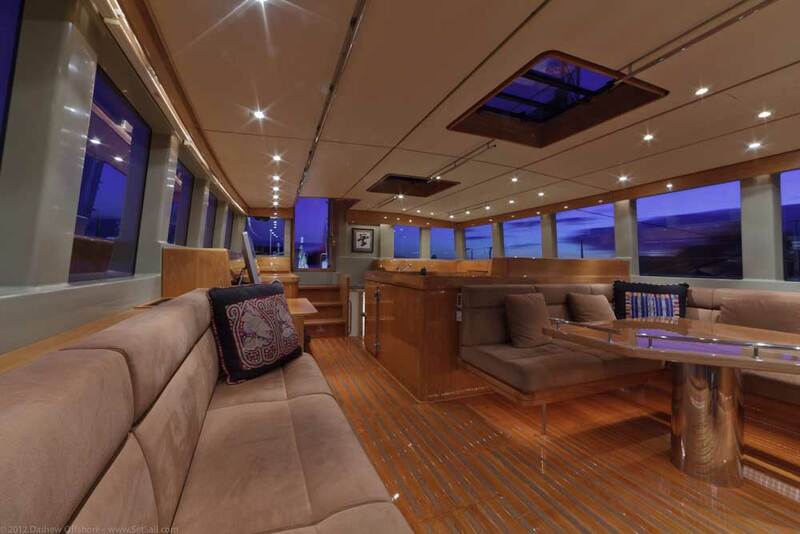 It is exceptionally difficult to convey the sense of spaciousness that will be present within this yacht when she is at anchor or on passage. The combination of the entire outdoor world, with the size and ambiance of the great room, will be breathtaking. 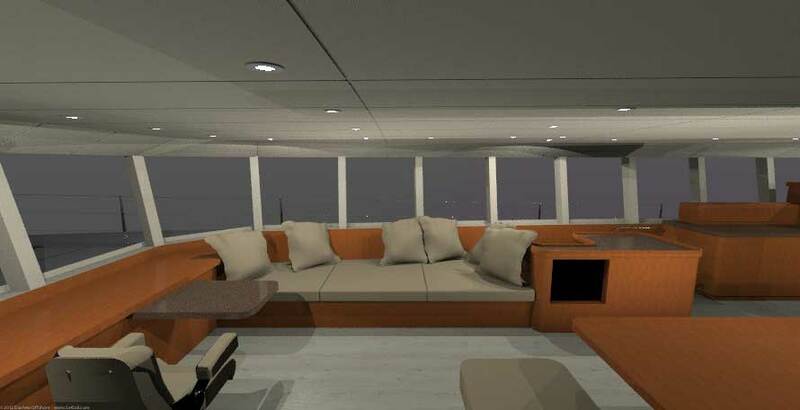 These renderings only give a hint of what lies in store when the first FPB is afloat and you first step aboard. Now for a few words about the aft end of the great room. Note that the appliance layout has changed slightly. The sink and stove have swapped positions, and we’ve gone to a different configuration of stove. There are a number of advantages associated with this, among which is a superior plumbing run for the stove extraction fan. The fan needs to be plumbed in a manner so that it remains dry in normal sea going conditions, and is easily sealed if heavy weather is in the offing. There is a space conflict with the oven below, so there is a good chance the oven is moving to the starboard side. We’ve been running simulations in various types of wood. This involves importing a photo of the proposed wood into Photoshop, then creating a “tile” and then applying it to various surfaces.. There is all manner of material available for the galley counters. This is a dark Corian test. 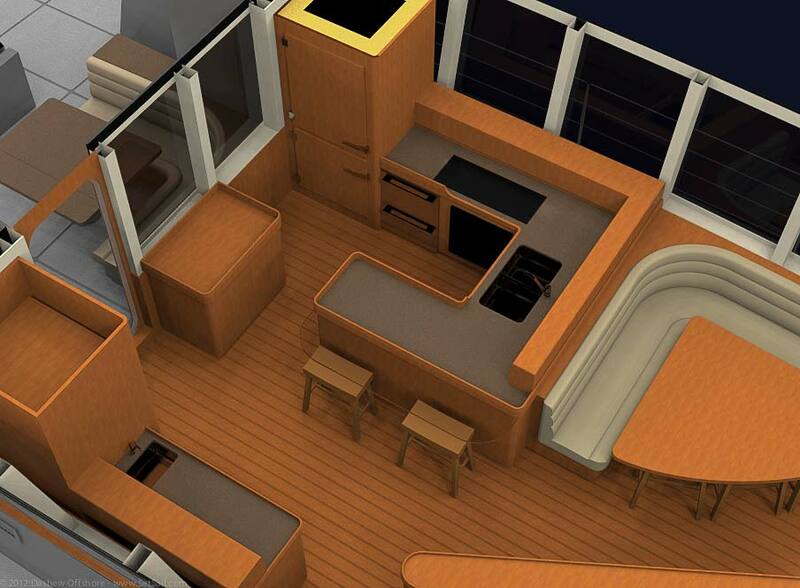 The above rendering shows the original galley layout. The glass breakfast bar extension to the counter has been exchanged for Corian. Otherwise the basic layout is maintained. And here’s where we are at present on 97-1, a light-colored LG counter top material. These two great room designs are poles apart in aesthetics, yet both make use of a standardized package of elements. This speeds the delivery time and makes it possible to deliver to the highest standard for a very efficient price. We’ll close with a couple of exterior renderings, which will help you get a feel for the relationship between the great room and Matrix deck. 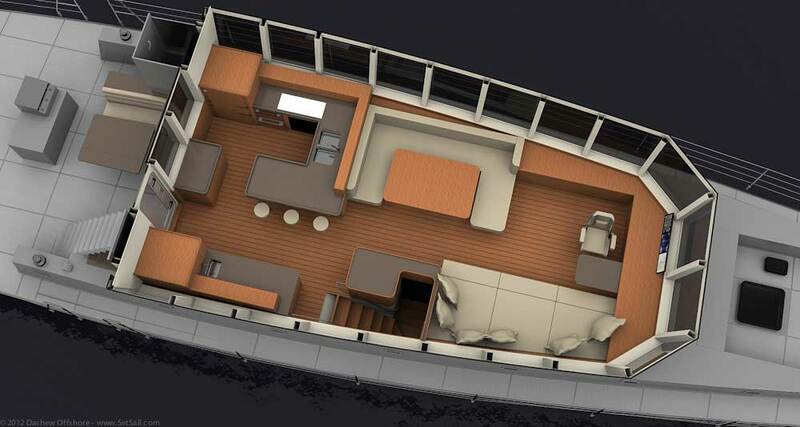 In terms of scale, keep in mind that the area of the Matrix deck by itself is larger than the great room of the FPB 64. And then finally a dose of realism to further anchor these renderings. 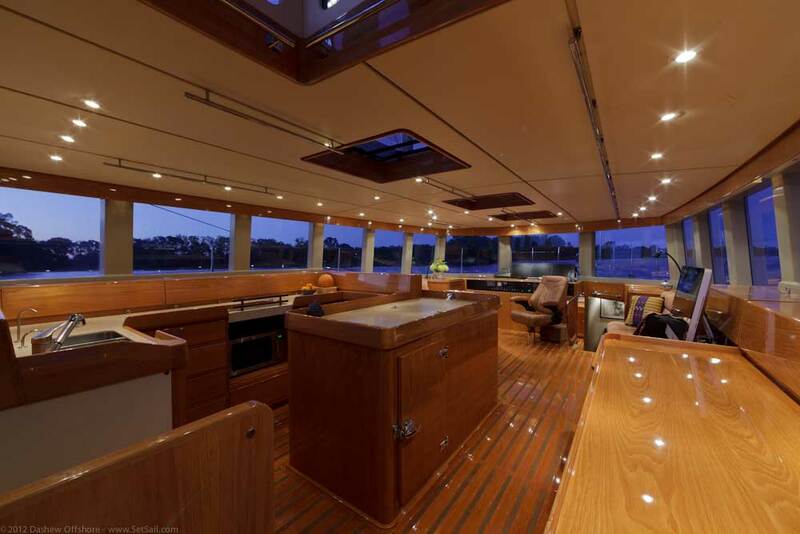 The great room on the FPB 83 Wind Horse tips the size scale at just about half the volume of the Wicked FPB 97. We are looking aft towards the galley here. The salon area on Wind Horse is roughly one third the size of the FPB 97. Above is the great room of FPB 64-1, Avatar. Back aboard Wind Horse, looking forward from adjacent the galley. While the Wicked FPB 97 is descended from the FPB 64 and 83, she is in a class by herself. There is nothing of which we are aware that compares. This entry was posted on Tuesday, May 29th, 2012 at 9:30 am and is filed under Wicked FPB 97. Both comments and pings are currently closed. The interiors of all three 64, 83, 97 are stunning. I especially like the great room wood floors in Wind Horse but wood does not appear to have been used in any of the other boats. Customer preference based on cost or upkeep? We cannot source quality golden Burmese teak these days. As always – looks great! 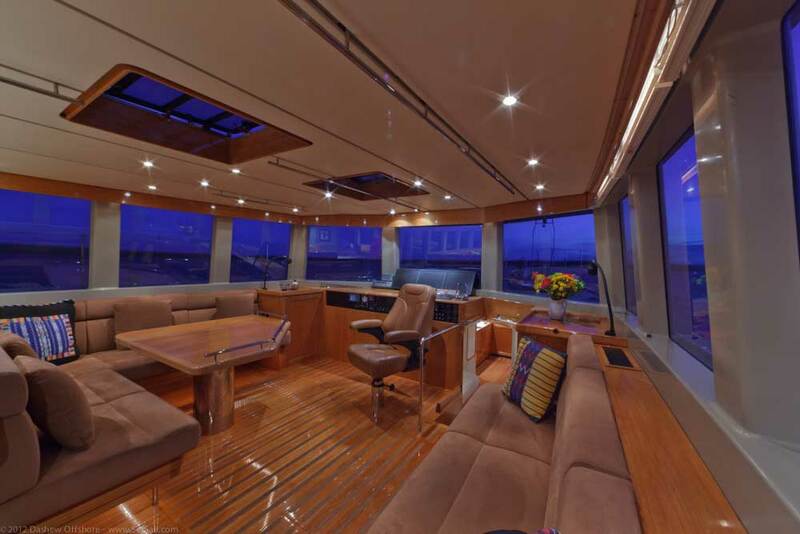 One item that has always intrigued me about the “great room” design (on all three yachts) is the lack of side hatches or doors to the deck. 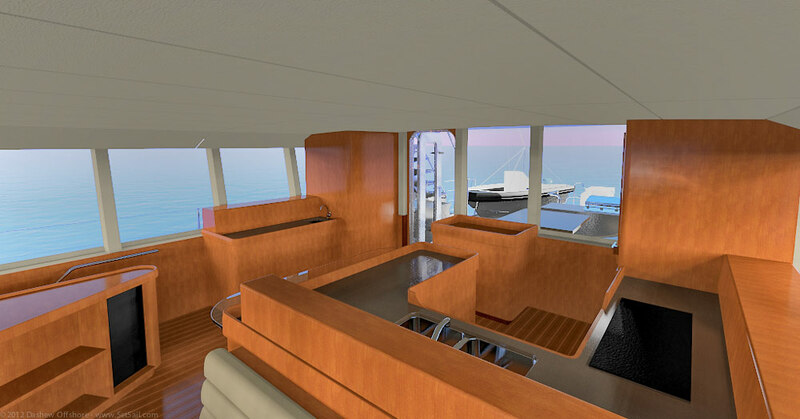 I understand that your concept for the great room is different from a traditional pilothouse, but, did you ever consider some form of access to the “bridge wings” next to the helm. I have always found it very useful when standing watch to be able quickly step outside to take line of sight, spot a buoy, manage a mooring or just get some fresh air – especially at night when interior reflections can obscure vision through the glass. As the length increases and the only egress becomes quite a distance from the helm the issue is magnified. Maybe offset by the much more robust upper deck? I’m sure the watertight integrity also a concern? I’m interesting in your thinking. There are port and starboard conning platforms on the Matrix deck. Creating an opening and structural discontinuity in the house sides is not appropriate in that may be dealing some day with severe weather. I noticed that the Grill is relocated in some of the new layouts. I think I like the new location better. The “Squared Up’ layout with the daybed is my favorite so far. Could the outside head not go under the stairs to open up a second lounging area aft of the great room? Also easier to nip to from either the marix stairs or great room door. Location of the dayhead is a trade off between easy access, the direction the main door swings for opening, the need for (or not) of a counter with sink for serving, etc. It could indeed go under the stairs, and has been there more than once, and will probably end up there again. Steve it looks like you’ve eliminated the possibility of using a steering wheel at the lower helm, judging by the leg space under the helm shelf. Given the Rossin’s experience with their autopilot failure, is that wise, or am I missing something? In a crewed scenario, the bridge becomes the main living area and vice versa. Is there an alternative layout where there is at least some segregation between the family and the crew. We have not had the time to work up isolated bridge layouts, but this is certainly possible given the space in which we have to work. Great looking images! What software are you using to put them together? Rhino 3D and Flamingo for rendering.